I have, for the last few years, selected a word to focus on for the new year. Some years it's taken me a while to find my word. This year, though, there was no soul-searching required: the word LIGHT came to mind, and it fits. I want to spread LIGHT and share my faith. I want more LIGHT in my house.... which means less stuff. I want to stop feeling weighed down by some personal things in my life. You get the idea. And yes, "This little light of mine...." IS stuck in my head right now, LOL! In addition, I want to spend January clearing out the pantry and freezer. 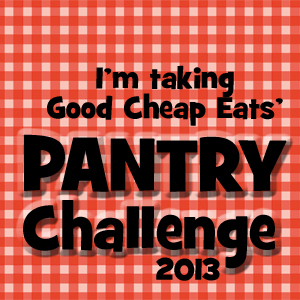 I was doing this on my own anyway, and then I happened to find the January 2013 Pantry Challenge at Good Cheap Eats. 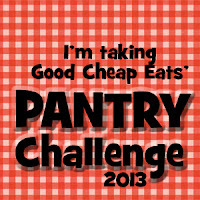 My goal is to only do one big grocery shopping trip in the first week of the month to stock up on meats-- we don't currently have enough on hand to last a month. I'd like to not shop at all, but that's not realistic. I also know that we'll need milk and fresh fruit throughout the month... I can't store enough to last that long. So, obviously, I won't be able to completely avoid shopping, but I am going to be very intentional about using what we have on hand as much as possible. And finally, just this morning I saw my friend Sarah post her personal book reading goal for the new year. She inspired me to set my own goal via GoodReads: 150 books this year. I don't usually keep track of how many books I read, so I'd like to try this year. I think 150 is totally do-able. Amy has read 0 books toward her goal of 150 books. So, there you have it. For a girl who doesn't really "do" resolutions, I guess I still seem to have made a few. What are YOU focusing on in the new year?